Reinventing the Old Mill: Allentown, NJ ~ The History Girl! Owners of historic buildings are often faced with the question of how their structure can be utilized. Some may decide to tear it down and start new, others may decide to gut it, a select few will try to donate it to a historic group to be preserved in perpetuity, and the truly dedicated will preserve it on their own. Preserving a historic structure, while adapting it for modern uses and making it profitable, is not an easy task. Historic buildings require more maintenance, custom materials, and specialized treatments than your typical building. Yet if you can reinvent your structure and attract sensitive, yet desirable tenants, there is a good chance that the building will persevere. Since the original structure was built in 1706, the Old Mill in Allentown, New Jersey has been continually reinventing itself, adapting to its circumstances and the needs of an ever-changing world. 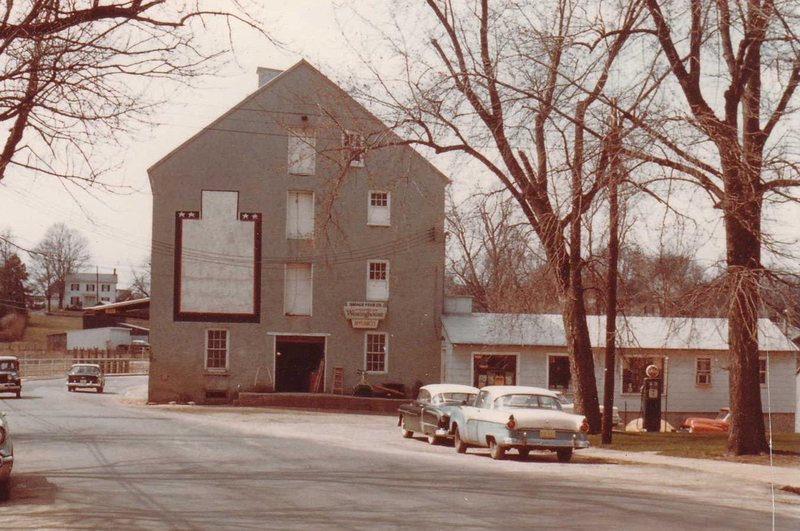 Corky Danch bought the Old Mill in Allentown in 1975, planned on restoring it, and then selling it after a few years. Almost forty years later, he is still restoring this magnificent structure, adapting it for modern uses while preserving the beauty of its utility and architecture. 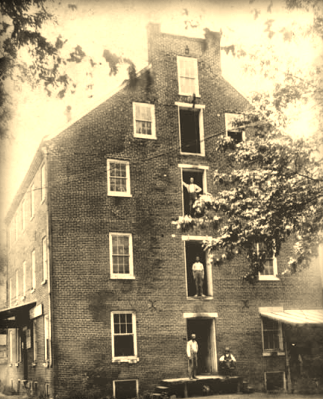 The history of the Allentown Mill begins in 1706, when Nathan Allen purchased 638 acres of land from Robert Burnett. That same year, he constructed a mill on Doctors Creek. The area became known as Allens Town. The area around the mill slowly developed as a trading community for the surrounding farm areas. The mill site, which also contained a cloth-fulling mill, served as a quartermaster depot during the Revolutionary War. There are accounts of interrogations of notorious Pine Robbers, loyalist sympathizers who preyed on patriotic citizens and businesses. Between 1706 and 1845 the ownership of the mill changed hands a number of times. In 1845, Abel Cafferty purchased the mill. In the early 1850s, most likely 1854, the mill suffered a fire according to notes that were written and preserved on the office wall of the mill. The notes state, “300,000 bricks were burnt up in the fire and put in this mill…and the first grinding on October 20, 1855.” Cafferty built what was considered state-of-the-art, using the most modern designs for “automated grist mills.” The circumstances surrounding the fire are unknown, but were not uncommon in mills. The fire gave Cafferty the chance to redesign the mill, since the original mill was heavily outdated by this time. The Old Mill, Allentown, NJ, circa 1905. Courtesy Corky Danch. 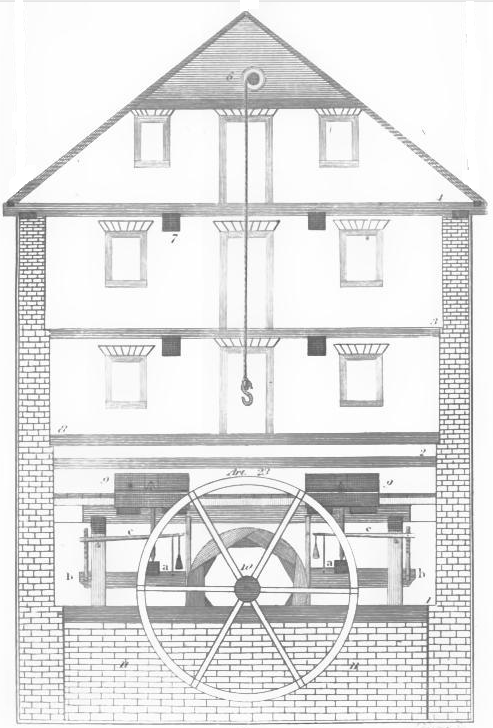 The design of the newly constructed mill was modeled after Oliver Evans’ patent for “automated grist mills.” Oliver Evans was a young millwright from Delaware who perfected the milling process in 1780 by building a completely automatic grist mill in New Castle County. Powered by a water wheel, the mill was the first continuous flow, production line mill in the world. An English book of the day described the mill: “Mr. Oliver Evans, an ingenious American, has invented ... a flour mill upon a curious construction which, without the assistance of manual labor, first conveys the grain ... to the upper floor, where it is cleaned. Thence it descends to the hopper, and after being ground in the usual way, the flour is conveyed to the upper floor, where, by a simple and ingenious contrivance, it is spread, cooled, and gradually made to pass to the boulting hopper.” The product was not touched by human hands from the time the grain was dumped into the receiving hopper until the finished flour flowed into a bin ready for packing into barrels or bags. Evans submitted a proposal for his design to the newly-formed United States Patent Office in 1790. Evans received the third patent issued by the United States government. 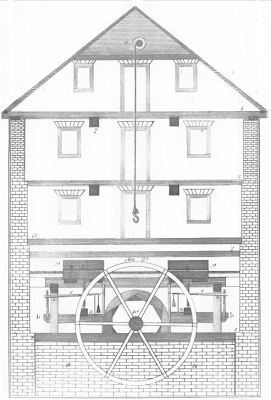 Oliver Evans design of a mill from his book The Young Mill-wright and Miller's Guide, 1848. The mill operated continuously until about 1950, when the owner sold the building to someone who no longer wanted to grind flour for human consumption and began mixing feed for animals. Although it was to remain a mill, it would no longer serve its original customers, signifying the end of small, community-based grist mills. By the early 1970s, competition from large industrial feed mills in the Midwest put many small, waterwheel driven mills out of business, as they could no longer compete with the output and pricing from the more efficient mills. Slowly, small hometown feed mills closed one by one. What would happen to the old mill in Allentown? Would it be able to adapt once again? In 1975, Corky Danch purchased the deteriorating, vacant mill building. Danch envisioned a community of local craftspeople coming together and teaching their skills. Danch spent two years restoring the mill, making it usable once again. Many of the original pieces, including the grindstones, had been lost over time. The restoration included using materials from other historic structures such as old homes and barns which were not going to be preserved. Some original mill equipment that was left behind was restored and put on display. One unique feature constructed was an interior partition wall consisting of old shutters. The old chutes that carried grains from one floor to another were converted into conduits for lighting. Danch established The Allentown Feed Company in 1977 and nominated the mill to the National Register of Historic Places. The building was listed on February 14, 1978. Danch’s new plan for the mill succeeded. For thirty years, the building found a new use as office space, gallery space, and restaurants. Businesses included The Black Forest Restaurant which was located on the mill’s first floor, the Off the Wall Craft Gallery, which enjoyed a 30-year run, and Spiders Café, a coffee house run by the Danch and his wife. In 2008, the mill received its next challenge. 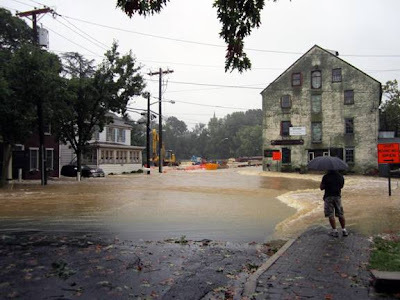 Monmouth County shut down the mill and its numerous businesses with temporary eminent domain while the replacement of the Allentown Pond Dam and County Bridge U-12, which carries Route 524/Main Street over Doctor’s Creek, was being carried out. While the bridge replacement project was progressing, Hurricane Irene hit New Jersey on August 28, 2011. Flooding took its toll on Allentown and the mill pond rushed over its banks, bringing torrents of water to the Mill and nearby homes. The mill’s basement was immersed in almost five feet of water and a fifteen foot drop in the driveway occurred due to soil being washed away. Despite these challenges, the Old Mill is not giving up the fight. In another burst of renewal, Danch is reinventing the mill once again. The building is being brought up to code, a new central air conditioning system has been installed, and Danch hopes to restore the 1904 waterwheel. As part of the County’s bridge replacement, the sluiceway, or water channel, which carries water from the mill pond to the waterwheel, has been restored. The waterwheel itself needs to be restored, but once it is, it will be used to generate power for the building. New businesses have shown interest in calling the Old Mill their new home, a positive sign that the historic building can still be used for modern purposes. In its 306 year history, the Old Mill site in Allentown has faced a number of challenges and has adapted to each one. The mill is proof that old buildings can be reinvented for modern purposes and serve beyond their original use. As this next chapter in the Old Mill’s history unfolds, the future looks bright for a grand reopening thanks to the hard work, enthusiasm, and dedication of its longtime owner, Corky Danch. Happy to see someone else out there has interest in such things :) Best of luck as you discover NJ History. Looking forward to you sharing! Thank you for sharing this little history lesson of our little town!